Imagine a day at an amusement park with wild rides, unusual sights, new experiences and surprises around every corner. That gives some insight into the Grand Rapids Symphony’s Classical series concerts “Pictures at an Exhibition” this weekend in DeVos Performance Hall. The park’s tour guide was music director Marcelo Lehninger. The special guest was violinist Stefan Jackiw, but the stalwart cast of colorful characters were the musicians of the Grand Rapids Symphony. It’s worth remembering that a rollercoaster ride would be no fun if was all downhill. That wouldn’t be a ride, it would be a fall. 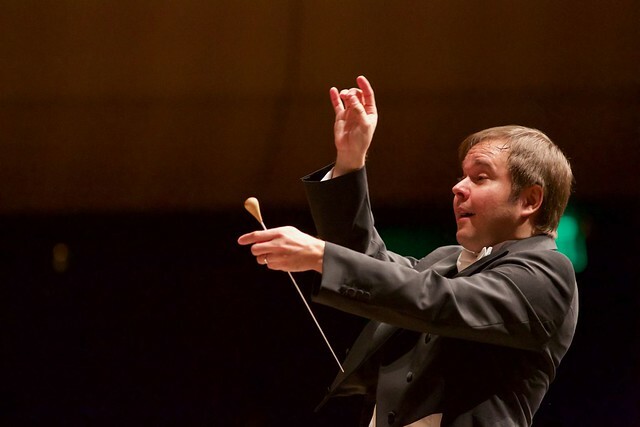 The new music director of the Grand Rapids Symphony led the Friday’s audience on an adventure with a soundtrack especially suited to the occasion for the Richard and Helen DeVos Classical concert that repeats on Saturday, March 4. Guests arrive in DeVos Performance Hall for the Grand Rapids Symphony's Classical series concerts on Friday, March 3, 2017. Music Director Marcelo Lehninger leads the Grand Rapids Symphony in Mussorgsky's 'Pictures at an Exhibition' with guest violinist Stefan Jackiw playing the Korngold Violin Concerto in D Major. Lehninger’s final concert of the season, entirely of music composed or arranged in the 20th century, had a lot to say and summed up his first season in Grand Rapids very neatly. John Corigliano’s clever Promenade Overture is a musical insider’s joke that leaves the audience, from start to finish, wondering what’s going on? The stage almost is empty at the start. The music begins in the wings. Soon, musicians begin filing on stage as they play, beginning with the piccolo and ending with the tuba. A fair bit of aleatoric music in the score allows time for the players to get from point A to point B without crashing into stands or bumping into chairs. Random chance makes each performance a little different. Even when they aren’t walking and playing, that alone keeps the musicians on their toes. When Leslie Gore recorded “It’s My Party (and I’ll Cry If I Want To)” and followed it a few weeks later with the answer song, “Judy’s Turn to Cry,” it was the same singer, in the same year of 1963. Corigliano’s Promenade Overture is an answer to Joseph Haydn’s “Farewell” Symphony No. 45, in which musicians, at the end, depart from the stage until only two violinists are left. This reply took some 209 years. That bit of cheek was followed by some of the most melancholy music ever written. When news broke of Franklin D. Roosevelt’s death and John F. Kennedy’s assassination among other terrible moments in American history, Samuel Barber’s Adagio for Strings is what a shocked nation heard on radio and TV. The pathos it projects properly balances sorrow and hope. Lehninger and the orchestra were equal to the occasion with phrases that were precise but felt free and flowing. The give and take between musical lines was carefully balanced with room to breathe. The audience, conversely, holding its breath at the climax, continued to hold it even longer. Lehninger has good instincts and trusts them. Just as importantly, his orchestra is learning to do the same. The piece ended with a lengthy period of silence before the applause. That’s proof that the performance did want the players meant to do. The evening turned on a dime once again with Erich Korngold’s exuberant Concerto for Violin in D Major, played with mesmerizing affect by violinist Stefan Jackiw with fine support from the orchestra. Korngold was the John Williams of his day, composing epic film scores for swashbuckling films such as The Adventures of Robin Hood starring Errol Flynn. In fact, without Korngold, there would not have been a John Williams, as the Oscar-winning composer has said himself. The concerto is full of references to Korngold’s movie scores, so if you’re of a certain age, you can play “Name that Tune” as you go. Anyone else can simply enjoy it on its own merits. Jackiw plays with a beautiful singing tone, and that’s always a good thing. The lusty first movement sets the story in motion; the lament in the middle movement reminds the listener that there’s no triumph over adversity if there’s no adversity over which to triumph. That sweet, singing tone is a necessity in the wild ride of the finale. It starts with a staccato jig, but it isn’t music just for virtuosos to strut their stuff. It’s music meant to be music, and Jackiw is a maker of music. Many concertos pit soloist against orchestra, and some soloists play that way all the time, no matter what. Jackiw has the skills and sensibility to settle back and play as a principal player within the ensemble when appropriate. It shows respect for the music and for his fellow musicians as well. Friday’s audience thanked Jackiw profusely, and he replied with an encore of the Largo from J.S. Bach’s Sonata No. 3 in C Major for solo violin – a four-movement work that, in its entirety, scares the bejesus out of violinists. The third movement is a simple pastoral song, though sometimes simple things are hardest of all. Listening to Jackiw play the continuous melody with virtually no hint of vibrato was transformative. Pictures at an Exhibition is a win-win. It’s an audience favorite. It’s also a favorite of musicians, so long as they don’t have to play it night after night, because Maurice Ravel’s arrangement is practically a concerto for orchestra. Solos by trumpeter Charley Lea, saxophonist Joseph Lulloff and tubist Jacob Cameron were delicious. Virtuosic woodwinds in Tuileries were magnificent. The piece in Ravel’s arrangement is full of so many shapes and sizes that must be fit together in a meaningful way. That’s the music director’s job, and Lehninger does an extraordinary job of it. The sonic motion of Bydlo’s lumbering approach from a distance and departure into the distance once more was evocative and effective. The energy of “The Ballet of Unhatched Chicks” was nimble and delightful while the breadth of the “Catacombs” was distinctive. Lehninger’s final concert of his first season with the Grand Rapids Symphony was a fitting farewell for now. But in this case, the grand and glorious melody of “The Great Gate of Kiev,” though it concludes concluding Mussorgsky’s Pictures at an Exhibition isn’t so much a farewell through a gate of departure. Rather, the blazing brass and pealing carillons signal that the gate of arrival is near, about to open on a bright, new future for the Grand Rapids Symphony.